About fifteen years ago, an announcement that I was using weapons as decor would have been met by the "eight and under set" with loud cheering, offers of help, and enthusiastic waiving of anything that could be construed to be a weapon for inspiration. At that time, these items may have included building blocks, microphone stands, wooden spoons, and occasionally, toothbrushes. This is apparently the same level of imagination which (unfortunately) caused my brother to believe that a kitchen towel firmly knotted around his neck would enable him to leap from the top of a cabinet in the living room and fly; or that which enabled me to (fortunately) convince my sons to believe that a cardboard box with a microphone stand with a towel tied to it, a stuffed parrot and a pair of binoculars in the middle of the family room was a pirate ship. Sometimes, imagination is a good thing. Other times, notsomuch. Amazingly, I managed to raise two sons without them ever having bows and arrows. Not even the kind with suction cups on the ends. I'm not sure how this happened but it probably had something to do with an unfortunate accident involving my cousin and a set of lawn darts in the 1960's. I'm not sure why but in my mind, the two are somehow related. 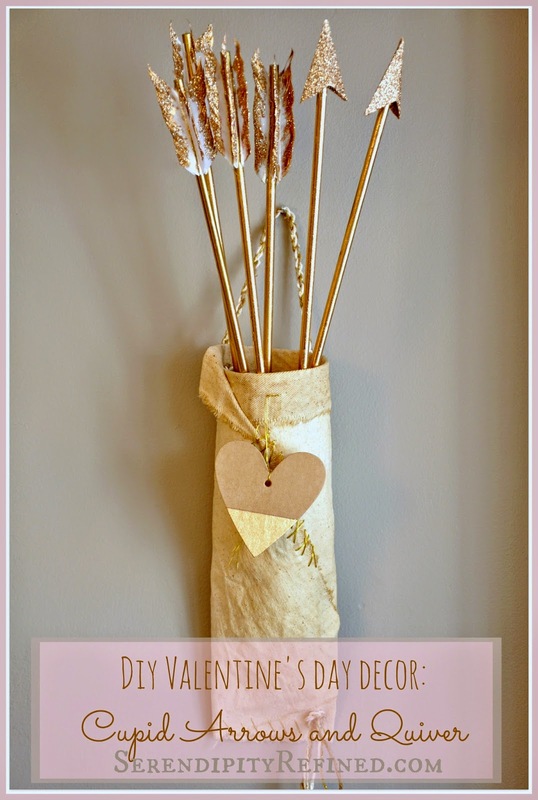 These cupid arrows are easy to make using 1/4 inch dowels cut to 18 inch lengths. Sharpen one end of the dowel using a pencil sharpener and paint the dowel gold. 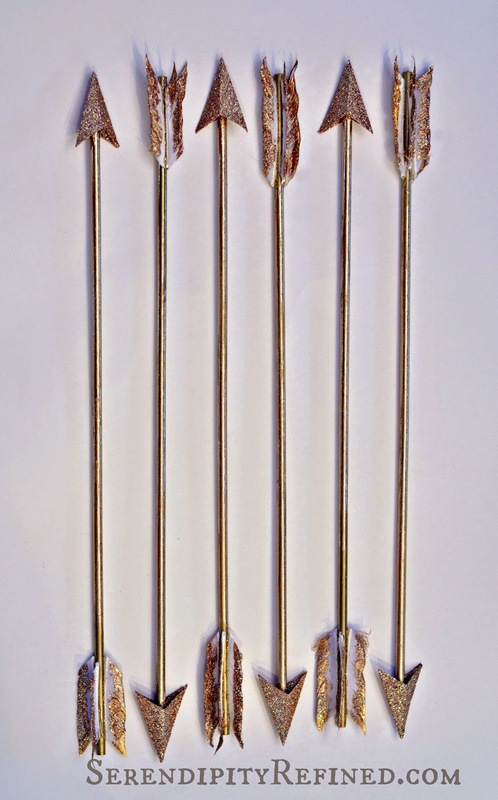 Cut 3 feathers as shown above for each arrow. 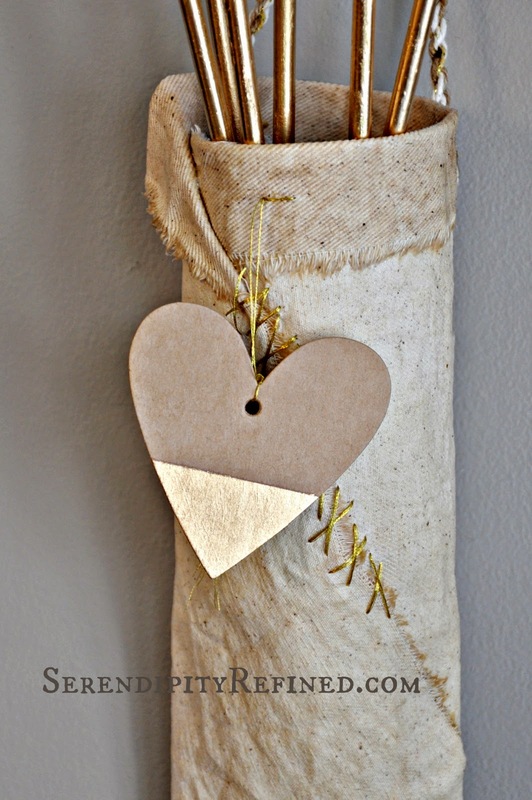 Cut one head for each arrow from card stock. 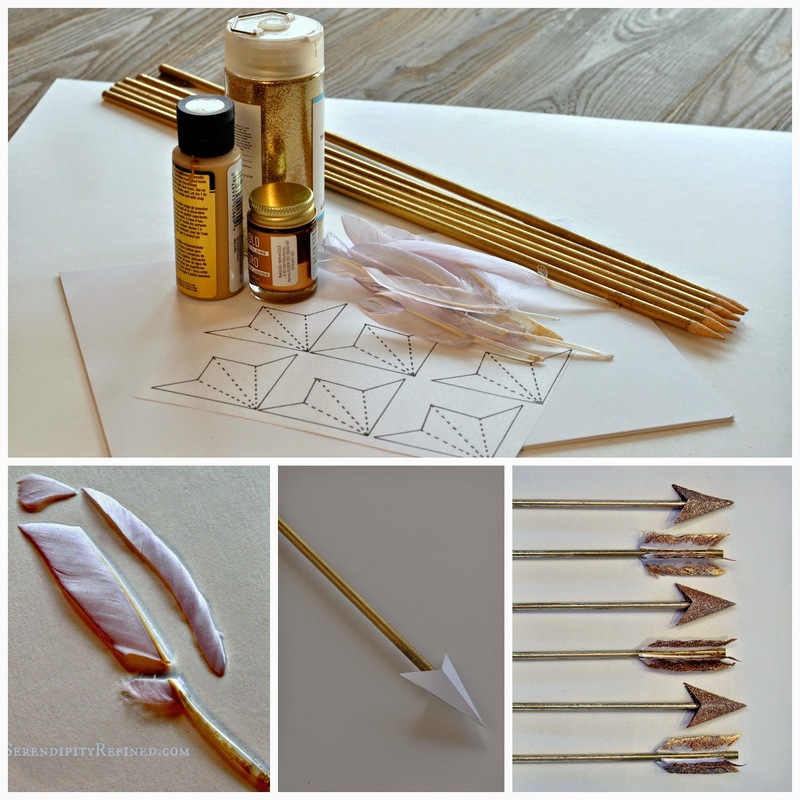 Download the arrow head pattern (HERE). Cut on the solid lines, score and fold on the dashed lines. Hot glue the head to the pointed end of the arrow and the feathers to the opposite end as shown above. Brush gold paint on the edges of the feathers then brush the head and the feathers with glue and sprinkle with glitter. 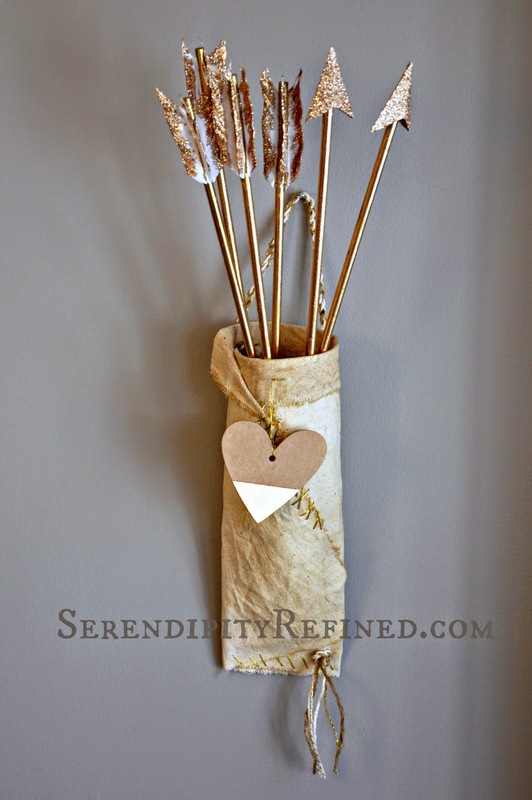 The quiver is made from a tea dyed piece of canvas that I wrapped around a bottle and painted with Mod Podge then added a few gold stitches and a cord for hanging. 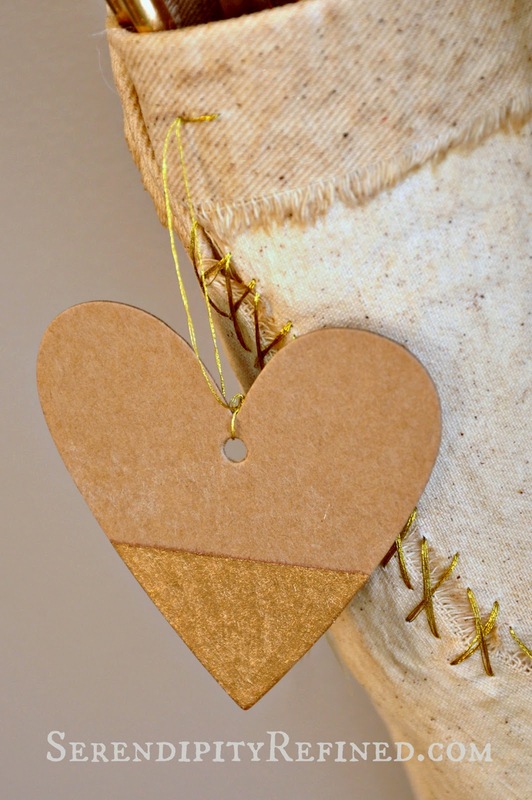 I also added a cardboard heart that had been dipped in gold paint. 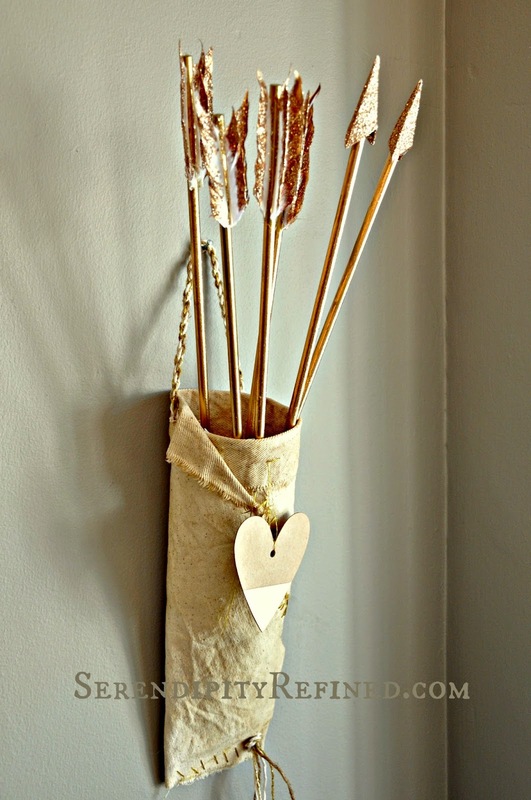 If you're making these arrows while there are still small warriors Cupid's living in your home, you may want to forgo sharpening the tips of the dowels. I did it to make them fit more securely into the cardboard tip but it's not a necessity. 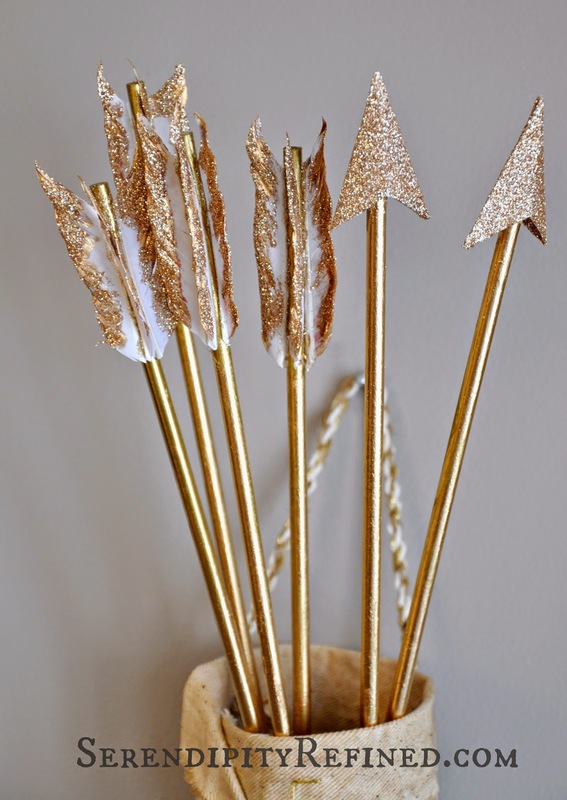 A DIY canvas quiver filled with sparkly gold glitter Cupid arrows for Valentine's Day. What could be more perfect?! To tell you the truth, I've never quite understood the correlation between love and being shot with an arrow by a chubby, half naked, toddler but I suppose that if I had given my sons those cute plastic bows and arrows with the suction cups when they were young, they probably would have cleared up my confusion within an hour. ....I'm blaming the water guns for that.